The other night, I was fortunate to be able to pull Set and Costume Designer André Barbe, left, out of Turandot rehearsal and to speak with him about this production and the career he shares. 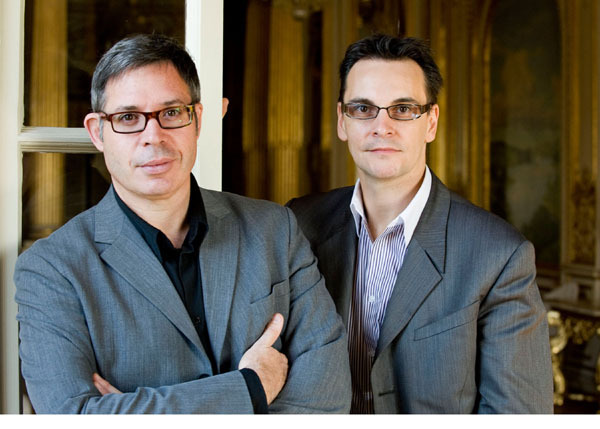 Barbe & Doucet make their Seattle Opera debut Saturday night with Turandot. We talked about such subjects as Ping, Pang, and Pong’s top hats and martinis; about the meld of North American and European influences on his work; and about his remarkable partnership with our stage director and choreographer Renaud Doucet (right). Let me first ask you the same question I asked Renaud, in a separate interview; could you tell us a little about how your partnership works? It’s unusual in being exclusive—often, designers who do new productions like to work with people they’ve worked with before, but in your case you ONLY work together. For instance, he doesn’t direct shows that aren’t designed by you. No, not since 2000. We are partners in life, as well as crime, and this business can be difficult because so many people end up going on the road and missing their family, their children and spouse and wife and boyfriend. So we said, why don’t we do a partnership and work together. I was working a lot in television at the time, doing my own thing, and he was doing his own thing, and we had to cut off some of the artistic relationships we had with other people, at a time when it was working quite well. But it ended up being a good decision. At the time, I was working a lot in television and theater, in Montreal, and suddenly reality TV started up and people decided there was no need for sets anymore. So the timing was perfect. After twelve years, now we realize it was the best decision we ever made. But at the time it seemed like a risk—you would be turning down work. It was a gamble. The thing is, we’re very different, we’re complementary. Renaud is from the south of France, and I’m from North America. Our language is similar, but it’s not the same. I think that’s our strength; I think the two of us together are stronger than me by myself or him by himself. Renaud is a Taurus, he will bang on doors and open them, and I’m a Pisces, I will be a little bit more in my mind. He’s fire and I’m water, what’s great is that together we can make water boil. But the water shouldn’t put out the fire, and the fire shouldn’t make the water evaporate. It’s a question of balance, and I think we’ve found it. You mention you’re personal partners as well as professional partners. Yes, we are. We aren’t married but that’s something we want to do, we believe in it. And legally, as Canadians, you’re allowed to. Here in Washington, we’re working on that. 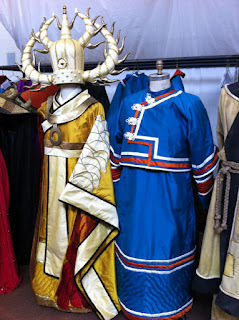 In any event, tell us more about the Chinese imagery, the symbols that have influenced your designs for this production. The circles, for instance...I was just noticing in there [points towards auditorium], you’ve created this series of circles as multiple prosceniums, so it ends up forming a kind of tunnel leading your eye to the back of the stage, where there’s this little box. Yes, yes, I loved it. 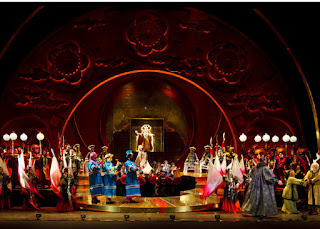 Interesting, that film is totally in the tradition of Puccini’s Turandot, a grandiose Italian spectacle about China. Yes, of course with Turandot we’re not doing the “real” China, we’re doing an Italian version of it. Puccini never saw what real China was. But in terms of the symbolism, the circle is an important figure in Chinese iconography, and everything in the set is a circle: the platform, the arches, the flowers, this shape of the disc which she wears in her costume—and we gave it to the Emperor and the chorus too, the soldiers and the wise men. Also, in a production like this, when you have to move a lot of people very quickly, it’s more interesting when it’s circular; it draws you in and brings people together. That’s what we wanted to do, with the set. And you mix time periods, too, in the design. 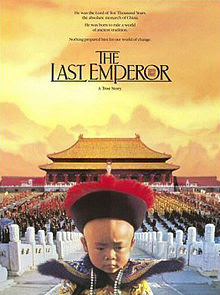 Well, we used different eras of Chinese history; we wanted to make the Emperor have the look of an older dynasty, with Turandot a younger one, and with Ping, Pang, and Pong being more toward the beginning of the twentieth century. They’re drinking martinis and smoking cigarettes. It may not be from the vocabulary of a fairy-tale Chinese court, but that’s not the only thing the show is about. These three want to do their job, but Turandot is preventing them. One is overworked by doing too many funerals, the other wants to do a wedding at last. The decapitated heads of Turandot’s former suitors are actually woven into her cloak, which we see during the Riddle Scene. How did you come up with that idea? Or chemically reduced to this state. We wanted something more than her headpiece, her jewels, her glamorous look. As she’s singing “In questa reggia,” she suddenly opens her arms and we see the weight of her responsibility, it’s frightening. And she takes off that coat when Calaf answers the riddles. Glancing through pictures of many of your productions, you seem drawn toward the fantastical and wild. Have you ever designed for historical or romantic realism? Not really. Since Renaud and I have been working together, we haven’t done much standard repertoire...and I don’t think we would do something like that, even if it were a verismo opera. 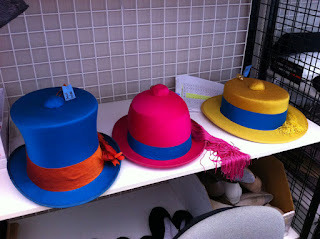 We created a Cavelleria Rusticana & Pagliacci; it wasn’t that crazy, but there was symbolism in it. It wasn’t just a village in Sicily. No. It took place in a baseball field, under an electrical lamppost with lots of wires going through it. The communication circuits were overcrowded, and you knew there was going to be an explosion at some point. So you see, we used a metaphor, but it was still a realistic place. We want the audience to understand the intentions of the composer perfectly. But we also understand that we are talking to a twenty-first century audience. So we’ll give them something they can understand, as well as a second and third and fourth degree for the people who are really into it. How do you make sure you’re addressing both levels? It depends on the audience. For instance, we did a production of Cendrillon, and because it was for a European house they wanted us to speak more about our culture than about French castles and princesses. We set it in the ‘50s in North America, but in a dream-world. The fairy godmother came from the TV, she was a sort of Lucille Ball character. And Cendrillon was cleaning up this big kitchen with electrical appliances. At one point in the fairy-tale they go to a magic oak tree, so here it was a drive-in theater, “La chêne enchantée” (The Enchanted Oak), we called it, and they were watching films of princesses such as Princess Grace or Queen Elizabeth II. They were sitting in a huge ‘50s car, and we wrote on the license plate “JM 1899,” just a little tidbit for those who knew Jules Massenet wrote that opera in 1899. Little details like that, not important so you haven’t missed anything if you don’t pick up on it, but it’s fun for those who are paying close attention. “Easter Eggs,” they call them, when you hide special features on DVDs. On another topic, who are your mentors and biggest influences, as a designer and person of the theater? My influences are a mixture of North American and European designers. As a child I used to watch a lot of musical theater films; those were a big influence on me, certainly, in terms of color. But traveling in Europe—I never lived there, but I travel a lot and always go to theater—I picked up more of a European flavor. I studied at the National Theater School of Canada, in Montreal, where you have people coming from all over Canada, and foreign countries, and classes in both French and English. My teacher, François Barbeau, a famous French-Canadian costume designer, who had worked with everybody, he was probably the biggest influence on me. He wanted us to learn to see things with different eyes: how do French people see, how do Americans see, why do they see this way, what’s important in this society. And Renaud and I have always taken this lesson to heart. If we’re asked to do a production of Turandot in the United States, it will be different from a production we do for Europe. Because you know the audience will see it differently. Yes, their backgrounds are very different. If you’re doing a rarely-done opera in the U.S. and it’s the first time most of the audience will have seen it, it’s most important for them to get to know the piece. But in Vienna, with The Magic Flute...there are three major theaters, each with their own current production of Magic Flute, and lots of previous productions. The people are born with it. I saw a little boy, 7 years old, listening to Magic Flute in Vienna and conducting it at the same time, and I knew: this boy has been raised with it. So they are ready for different approaches. They can go to the Staatsoper and see a traditional one, they can go to the Volksoper and see a wacky one...but sometimes when you present a piece here in North America it’s the only time it’s going to be presented. Turandot, for example. We haven’t done Turandot here in Seattle since 1996. Jon, I love the translations you do for the "titles" projected at performances -- BUT were you the one who translated "figlio del cielo" as "son of the skies" (cieli)?? "Cielo" is singular, and I believe the Chinese of this fictional era in CVhina believed their Emperor was the "Son of Heaven" ("figlio del cielo") and came from heaven (especially when played by Peter Kazaras!!). By the way, I loved the way Andre's sets tell the story so well visually in the Seattle Opera E-mail I recently received showing the sets for almost every significant part of the plot!! Thanks for your comment, Win! In the discussion above I think the point was the astrology/astronomy of TURANDOT, that the little box at the back of our set can be the moon or the sun, yin or yang depending, but it's definitely up above the earth. As you know, 'cielo' means both 'sky' and 'Heaven'...only in English do we use two different words, with slightly different connotations, for that thing up there.